You are here: Home / Pregnancy / Healthy Seafood Recipes…for Pregnancy & Beyond! You may have read my previous post Should You Eat Fish While Pregnant? If so, you know I promised more seafood recipes to get you started. I always keep my promises (eventually) so here are lots more yummy recipes that use several kinds of seafood. The recipes are handpicked for rich content of omega-3 fats, easy prep, and of course, interesting flavor. Not pregnant? These recipes are still bound to please the pickiest of palates. 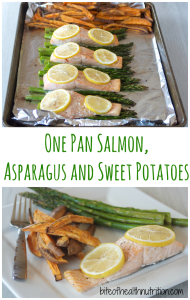 If you are just testing the waters on how to cook salmon, this recipe is perfect! The first recipe comes from Jodi Danen RD over at TheAverageRD. Often with seafood, simple is best to enjoy the wonderful flavor of fish. This recipe is for the oven but you can also easily do this on the grill or in the microwave if you just don’t feel like heating up the oven. Cooking for two? I often bake small amounts in the toaster oven. Keep it simple with this recipe from TheAverageRD! Next up is another simple recipe. Lauren Sharifi RD over at BiteofHealthNutrition had people like me in mind when she developed this recipe. I hate cleaning up. (Just ask my husband). This recipe helps you make a complete meal in just 30 minutes–and if you are really good at wrapping the foil around your baking sheet, you’ll really have NO CLEANUP! Perfect! Hate to clean? This one’s for you from BiteofHealthNutrition! 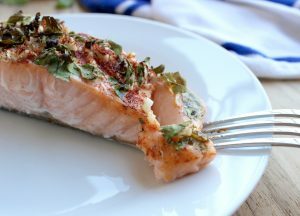 I love cilantro and garlic and this recipe from Kaleigh McMordie, a future RDN (and fellow Texan) over at LivelyTable, has combined these 2 ingredients with salmon to make a tasty and super easy oven-baked dish. Did you know that salmon is a great source of Vitamin D? (It’s super important during pregnancy & for the rest of your life too. Most people don’t get enough D.) Kaleigh points out just how much vitamin D from you’ll get from 3 oz in her post. Garlic & Cilantro? Yes, Please! From LivelyTable. Crunchy? Check. Bite-sized for little fingers or tapas parties? Check. Gluten free? Check. Chock full of nutrition? Double Check! 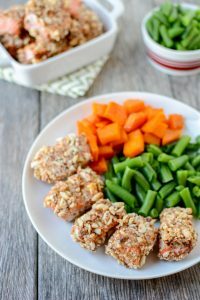 This 6 ingredient (yep you read that right) crunchy salmon nugget is perfect for the whole family. I also see this as great for a picnic and other times you want to eat with your fingers:) It’s from Lindsay over at TheLeanGreenBean. Lindsay is a fairly recent new mom and so her recipes will speak to you if your are also looking for easy. Got kids in the house? Try this from TheLeanGreenBean. Sardines. I’ve gotta be honest here, they are not top of my list of favorite foods. Also to be clearly transparent (! ), I have probably only tasted a tiny bite. Or was that an anchovy? 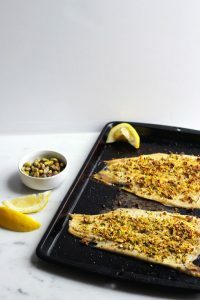 I’ve always recommend them as they are high in omega-3s, low on the food chain (fewer pollutants) and of course, they can be kept in your pantry for a quick meal. 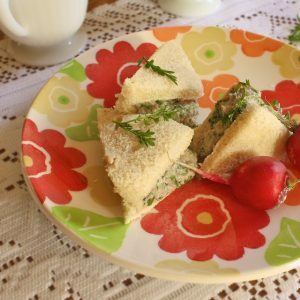 So when I saw this recipe from Serena Ball RD over at TeaspoonOfSpice (along with loads of great tips on how to best work with sardines), I realized that I had not given sardines a fair try. So I’m challenging myself (and you) to try this recipe. Let me know how you like it! I challenge you to try sardines! From TeaspoonOfSpice. OK, so maybe you’re not into salmon or sardines. How about trout? 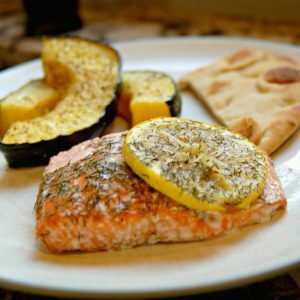 Trout also has a decent amount of omega-3s and because filets are so thin, they cook in no time! Another simple recipe (do you see a trend here?) this recipe is from Meri Raffeto RD on a post by Deborah Davis RD over at RealLivingNutrition. Did you know that the average diner eats >1,500 calories, 28 g of saturated fat and >3,500 mg of sodium in an average chain restaurant meal? (That doesn’t even count appetizers (like chips and salsa), or dessert! Yikes! Even more reason to cook at home. 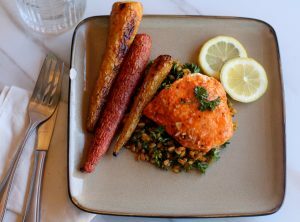 In her blog post, Katie Cavuto RD at HealthyBites shares this info from a Drexel University study along with 6 Simple Salmon Recipes. Yay! Keep this in your back pocket and you’ll always have a salmon recipe that matches your mood. Who says you can’t eat spicy when you’re pregnant? Or for that matter, breastfeeding? Unless it bothers you, there’s no reason to avoid spicy food, especially when breastfeeding, as the food flavors in your milk can actually help your baby get used to the foods you usually eat. Once he eats solids, those flavors are like old friends! (Nursing moms used to avoid garlic but some babies actually prefer garlic-scented breastmilk!) Win-win! 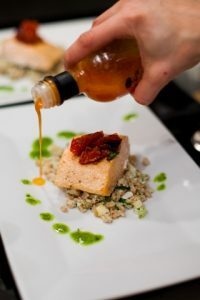 This recipe from Dixya, another Texas RD, at Food, Pleasure & Health, is super simple–4 ingredients using a French cooking technique called “en papillote”. If you’ve ever cooked in foil on the grill or campfire, you’ve got this! I just had to include one more recipe here, so stay with me. EA Stewart RD at EAStewart.com had this Asian spiced recipe that wowed me. 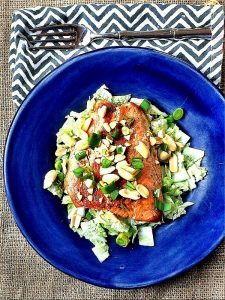 I have a weakness for Asian flavors like sesame oil, peanuts and napa cabbage so this recipe was calling my name! It calls for Gluten-free Tamari or Braggs Liquid Aminos, but if you’ve got soy sauce in your fridge, that works too. Thanks to all the wonderful Registered Dietitians and RD-to-be for making this post possible! Please check out their wonderful blogs. « Should You Eat Fish While Pregnant? Great article…and honest opinions Bridget! You gotta give poor ol’ sardines another go! Thanks so much for including my recipe! I can’t wait to try all of these delicious fish recipes! Wow, salmon nuggets are a great idea. I bet this would be a great way to introduce seafood to kids. I LOVE seafood and all of these ideas look so delicious!